WALTZ: The romantic Waltz is one of the most popular ballroom dances of all time. Considered by some as the "mother of present day dances" and the "backbone dance" of the ballroom, the Waltz is the basis for many dances. Developed in Germany, the Waltz is popular all over the world. A truly romantic dance, the Waltz is comprised of soft, round, flowing movements. TANGO: One of the most fascinating of all dances, the tango is a sensual ballroom dance that originated in South America in the early twentieth century. Tango is performed by a man and a woman, expressing an element of romance in their synchronized movements. The popularity of the tango has greatly increased over the years. VIENNESE WALTZ: The Viennese Waltz is the classic, original Waltz often featured in old films. The elegance and charm of the Viennese Waltz reminds us of glamorous balls in the palaces of Europe. 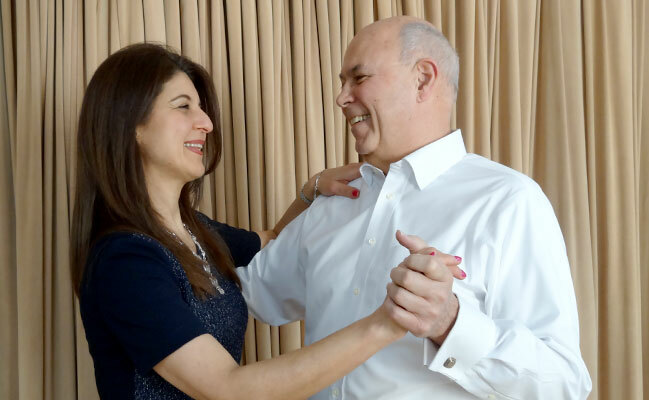 A waltzing couple rotates around the floor, revolving gracefully around each other. The Viennese Waltz is a quick, rotating dance, much faster-paced than the classic, slow Waltz. The simplified social version is a beautiful, non-strenuous dance that dancers of all abilities can enjoy. 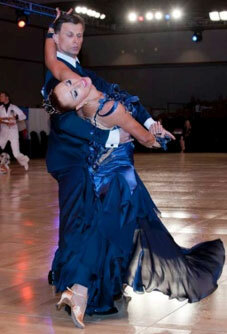 QUICKSTEP: Elegant, smooth and glamorous, Quickstep dancers are energetic while appearing extremely light on their feet. It should appear that the feet of the dancers barely touch the ground. CHA-CHA: The Cha Cha is one of the most popular of the social Latin-American dances. Lively and flirtatious, the Cha Cha is full of passion and energy. RUMBA: The Rumba is a dance that tells a story of love and passion between a strong, male lover and a coy, teasing woman. Full of sensual movements, the Rumba is considered by many to be the sexiest of the ballroom dances. This dance of love is one of the most popular ballroom dances and is seen around the world at nightclubs, parties, weddings and dance competitions. SWING: Swing dance is a lively style of social dancing in which a dancer often turns, spins and flips his or her partner. Considered both hip and cool, swing dancing is a favorite among social dancers of all ages. BOLERO:The Bolero is often called the Cuban "Dance of Love", because of its slow and dreamy tempo, and it's beautiful melodies. MAMBO:Originally from Cuba, the Mambo is enjoyed throughout the world at both the social and competitive dance levels. 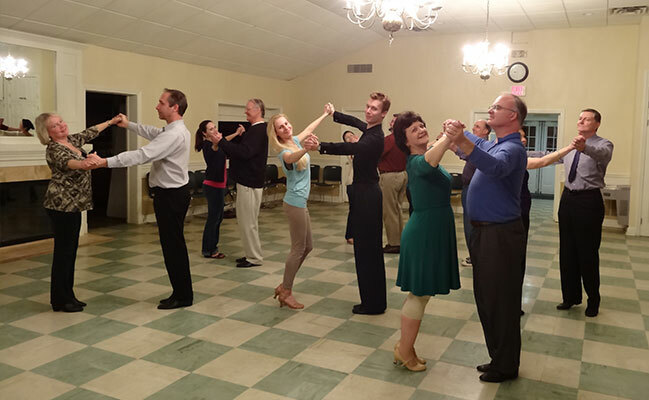 The mambo is a favorite of ballroom audiences because of its high energy level and infectious rhythms. SAMBA: Developed in Brazil during the 19th century, the Samba is considered the dance of celebration and joy at Carnival celebrations in Rio. 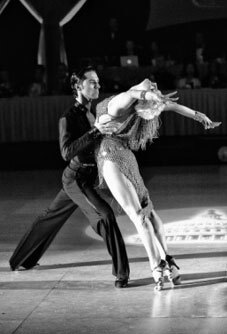 Lively and rhythmical, Samba, one of the popular Latin dances in ballroom competitions, is made up of many different South American dances mixed into one. SALSA: A very energetic Latin dance. Lots of fun, complete with spins, sharp movement and crisp turns. Very popular in Latin clubs along with Merengue. Styles vary depending on where you are from.